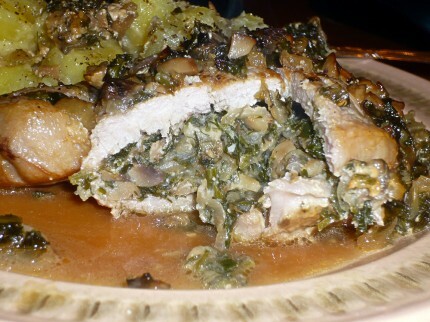 Although at first sight stuffed pork chop recipes might seem complicated, they are just as easy as any other pork recipe. All you need to take into account is that the total cooking time will be longer, because you have to prepare the stuffing, then to cut pockets in the chops, then to fill them with the stuffing. 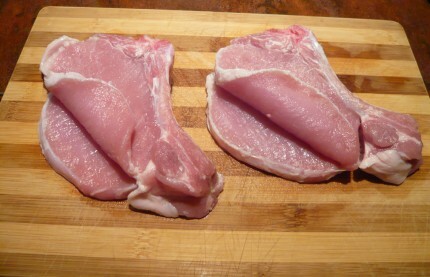 Most recipes call for boneless pork chops, but I think bone-in ones are nicer: cooking meat on the bone gives it a special flavor, a sweetness which I really like. Salt the meat, season it with your favorite herbs (I used a mix of garlic powder, thyme and basil) and put it back in the fridge while you work on the stuffing. 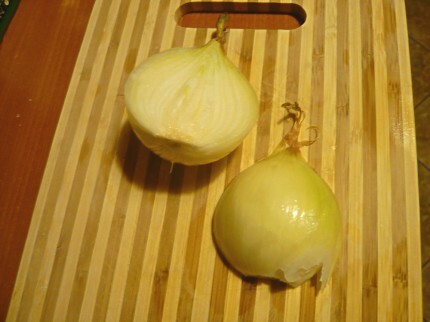 Take one medium sized onion, cut it in half and peel it. Chop the onion. 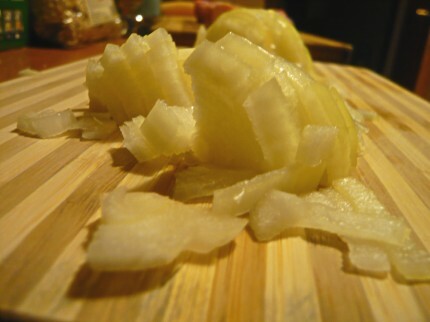 Coarsely chopping is just fine, you don’t need to try too hard on that, because it’s going to be cooked for quite a long time anyway. Take about 10 white mushrooms. I chose medium to small ones, like you can see in the following photo, and they were more than enough for stuffing the two pork chops you’ve seen. Wash them very well. 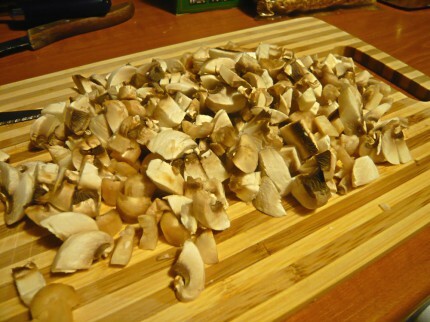 Chop the mushrooms and the stems. Don’t worry about making them really small. In a non-stick skillet, heat two tablespoons of extra virgin olive oil. Add the onions. 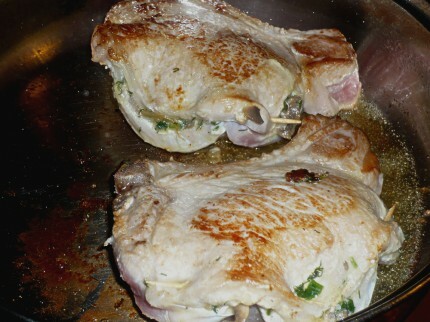 Cook them over medium high heat for about 3-4 minutes, stirring a couple of times. 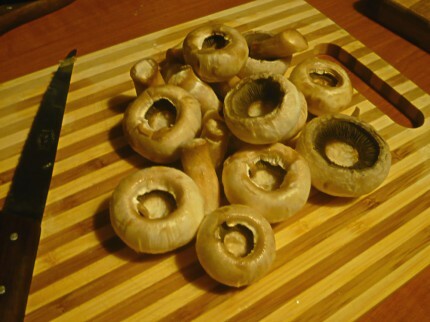 Add the mushrooms, stir and season with salt, pepper, red chili flakes and any herbs you like. 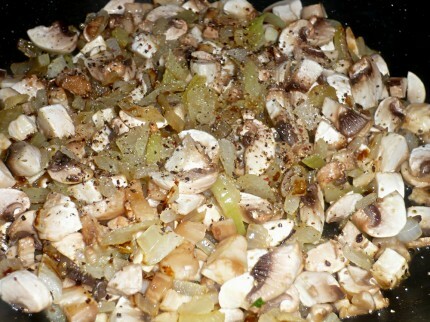 Cook the mushrooms and the onions over medium heat, for about 4-5 minutes, stirring occasionally. 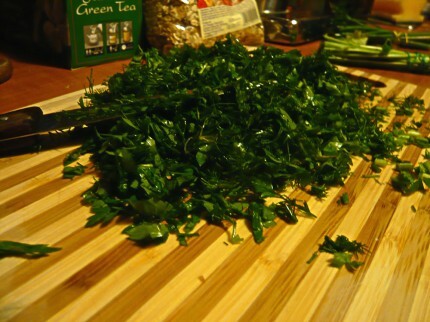 Meanwhile, take the parsley and the dill, wash them very well and chop them. The stuffing still needs something to hold everything together. I used a slice of feta cheese. Other options are: any type of cheese that melts nicely or eggs. 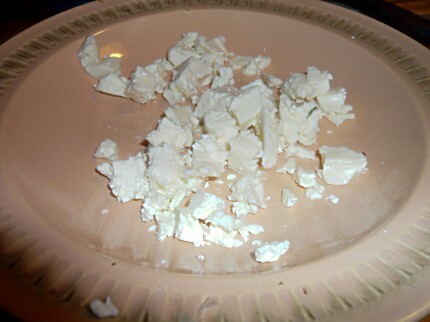 Here’s my cheese, crumbled, just before adding it to the skillet. There’s nothing special about this photo, I just want you to see how much cheese I’ve used. Add the cheese to the skillet. Cook for about 5 minutes, over low heat. Stir frequently, otherwise the cheese will stick to the skillet. When most of the cheese melted and mixed with the other juices in the pan, turning into a sauce, remove the skillet from heat. 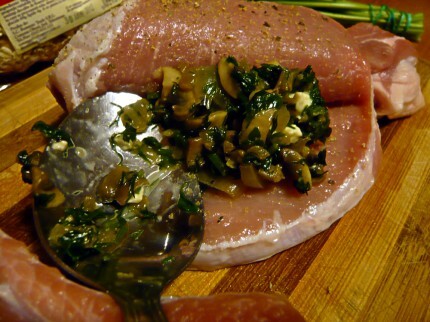 Spoon the stuffing into the pork chops. You’ll notice you’ve got more stuffing than needed. 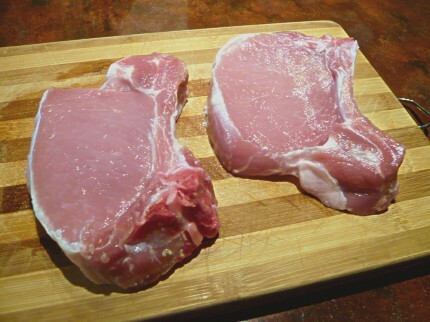 Don’t try to fit it inside the chops, because we are going to use it later on. Just use only as much stuffing as to allow you to secure the meat pockets with toothpicks. As you got here with the work, you may want to pre-heat the oven to 400F. Transfer the chops from the skillet to the baking dish. 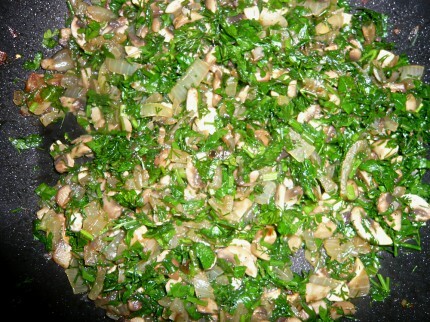 Take the remaining stuffing mix, put it in the skillet, add about half cup of water and cook over medium heat, stirring frequently. 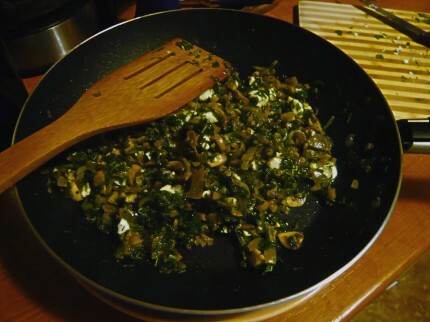 Your purpose is to mix the flavored brown stuff on the bottom of the skillet with the mushroom-onion mixture. 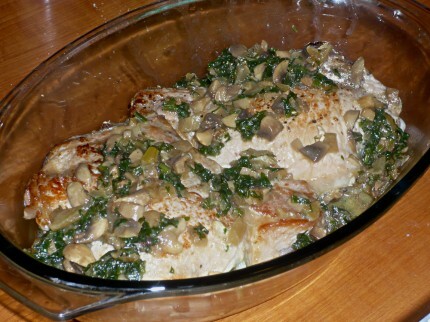 Eventually, you are going to pour it over the pork chops, before baking them. 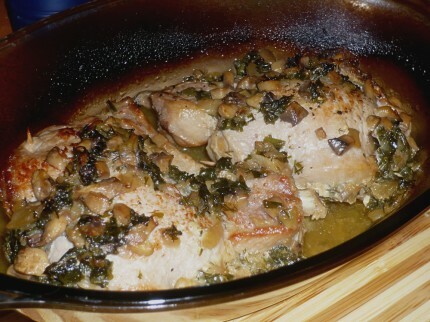 Cover the baking dish and bake the pork chops for about one hour. You may now relax for 40-45 minutes. 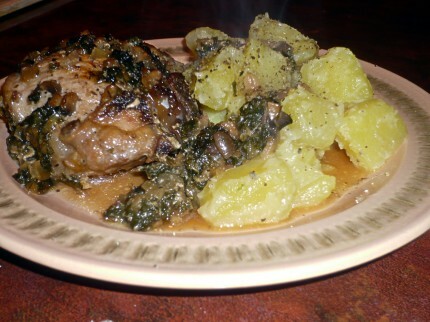 Just before the chops are done, you’d better get back to the kitchen and prepare some side dish. I boiled some potatoes, then drained the water and mixed them with butter and salt. 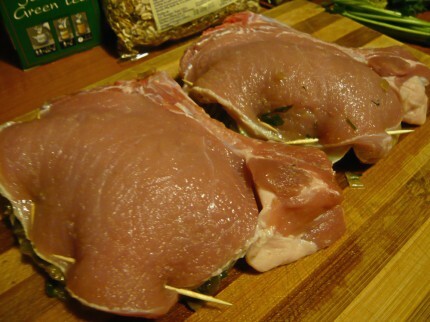 Last but not least, I thought you might want to see how those stuffed pork chops look on the inside.